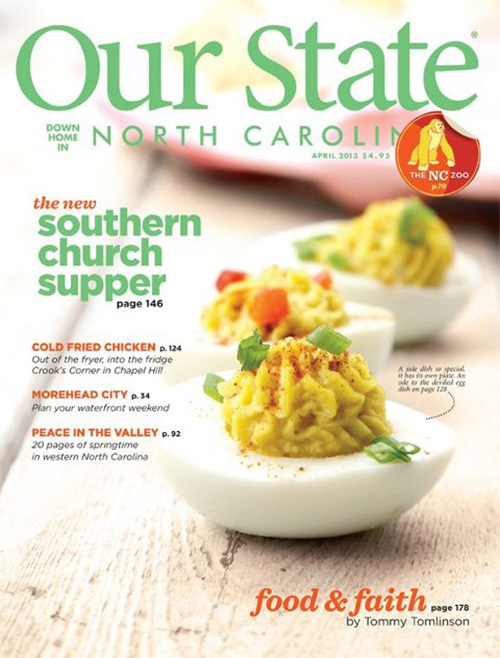 A few weeks ago I was invited to Chapel Hill for the launch of the Our State Magazine April issue, an issue that focuses on food in the great state of North Carolina. 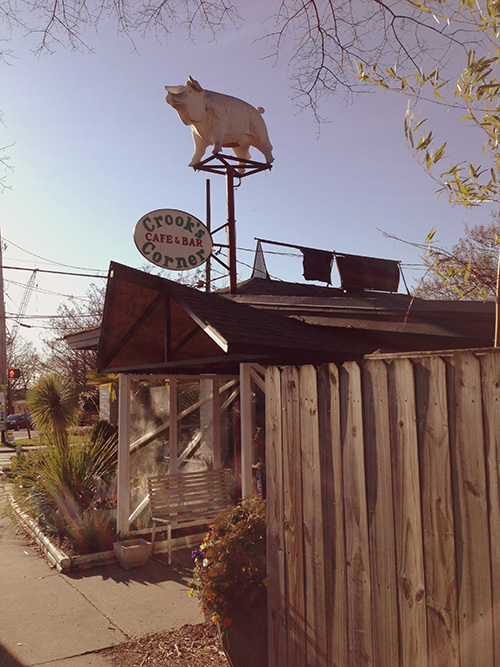 The party was at Crook’s Corner, the famous Chapel Hill restaurant that is home of one of the best adaptations of Shrimp & Grits around (the recipe that taught me everything I know about loaded grits), and the flagship of Chef Bill Smith’s culinary empire. The menu was simple and reflected the food showcased in the issue- benne, deviled eggs, house-cured ham on fresh biscuits, and a cocktail that I thoroughly enjoyed- a gin martini made with Cardinal Gin. 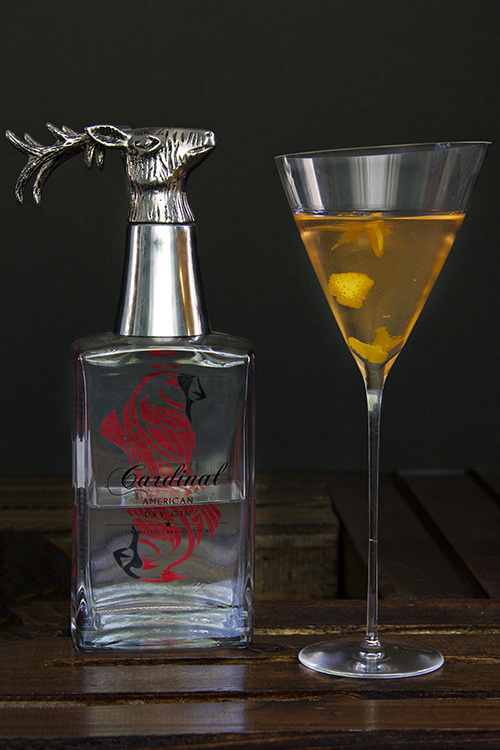 Cardinal Gin is distilled in Kings Mountain in small batches and has all the intricate and delicate flavors you hope for with a bottle of nice gin. 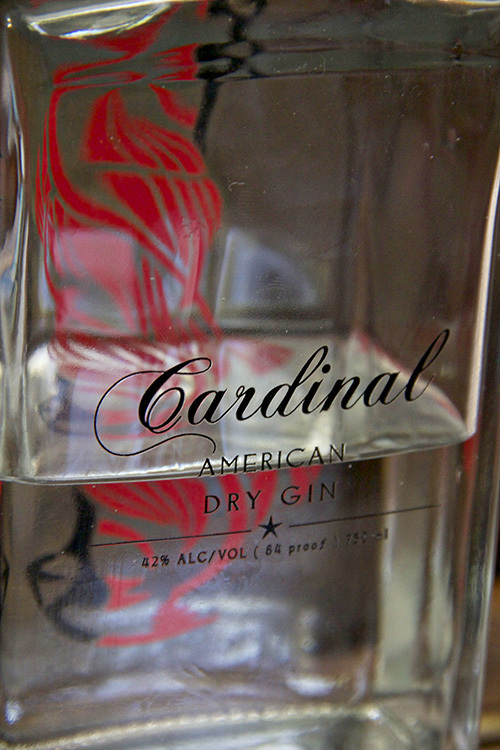 This is not the gin you blend with a heavily flavored mixer- this is a gin that you sip and let speak for itself. I’m pretty terrible at cocktail parties, I get anxious and awkward and have to resist the urge to hide in a corner and just watch. This cocktail party was no exception, especially because everyone seemed to know each other and I felt like the odd duck out. But I didn’t drive two hours to sit in a corner so I got out there and mingled, and I’m so glad that I did. I met a ton of great people, made some good connections, and got to talk about one of my favorite things- Southern food- with other enthusiasts. This issue is really fantastic. I always love Our State and the stories that it culls from across the state, but this one spoke especially close to home with stories about Morehead City and small community potlucks. It also gave me some ideas for new places to visit (like Yadkin Valley) and recipes to try (benne!). 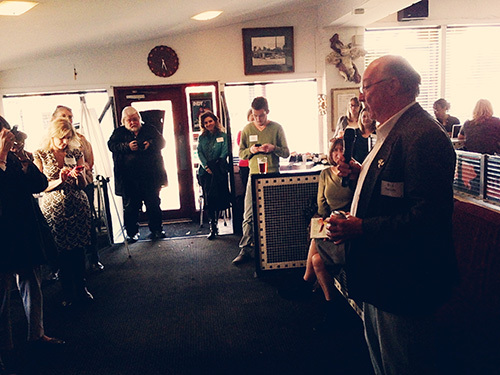 The party was also a huge success in that I got to talk to some of the magazine staff about Tasting North Carolina, an opportunity I’d been hoping to have since I dreamed the project up. It just so happens that they loved the idea of the project and wanted to partner, so for the past few weeks we’ve been going back and forth with different ideas. Without further ado I’m excited to say that starting in May Our State will be publishing the entire series on their newly formed blog. The recipes will be posted on both Our State and B&S which means, hopefully, more people reading, more people loving, and more people sending me recipes. Next up in the series? A trip to the North Carolina Pickle Festival in Wayne County. 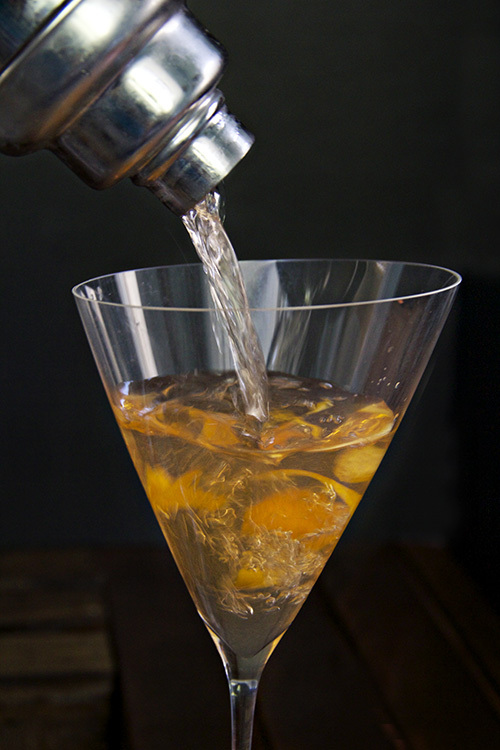 Combine all three liquors in a tumbler with ice. 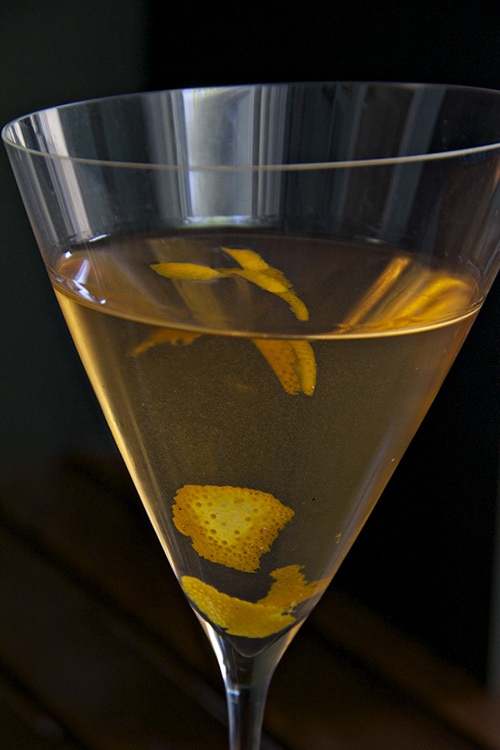 Shake and strain into a glass, garnishing with orange peel. When you start a blog it’s only natural that you look to other blogs around you, amazing ones, to model yourself after. Actually that’s true of everything in life, not just blogs. You look for inspiration in the world and incorporate pieces of what inspires you into your own life. And for the past 4 years (almost 5!) as I’ve been building Biscuits and Such and looking to blogs that inspired me I’ve taken note of what blogs were winning what awards and thought to myself- that is the goal. You’ll know you’ve made it when you’re there. And I’m really thrilled and overwhelmed and humbled to say that I found out yesterday that I achieved one of those inspiration milestones. 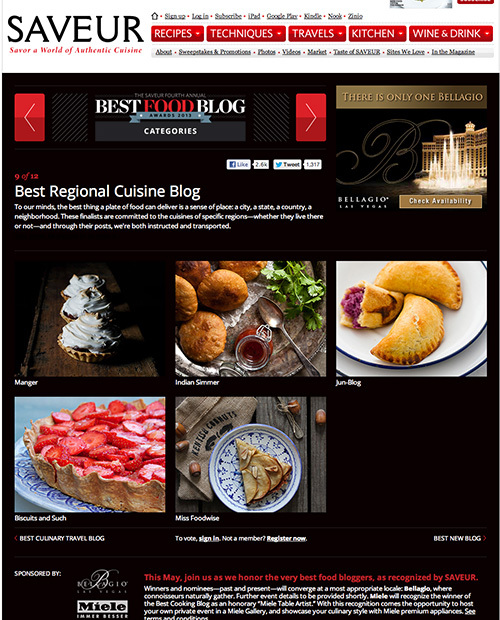 I’ve been nominated for the Saveur Magazine 2013 Best Food Blog Award in the “Best Regional Cuisine Blog” category. I’m up against four amazing blogs from all over the world and part of a cast of a few dozen fantastic finalists. I am so excited and proud and amazed I can’t even begin to express it. Saveur looked at all the blogs nominated (and thanks to whomever nominated me, that was an exciting surprise!) and chose finalists based on their entire 2012 archive. What I’m saying is that I can only assume I made it this far because of that pan we lit on fire. A vote for me is a vote for cast iron. 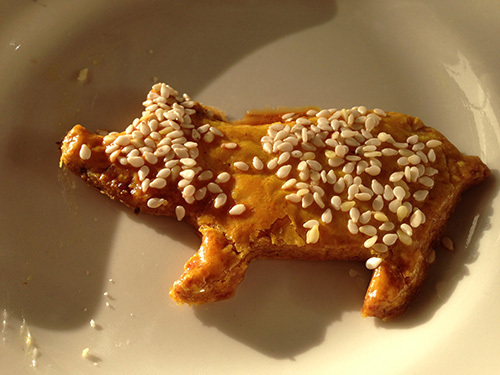 Voting goes until next Friday, April 19th, and can be done on Saveur’s website, saveur.com. You have to register to vote in order to prevent fraud (like that time I was in a recipe contest many years ago and my mom created a bunch of fake email addresses to vote for me), and can vote once in each category. It’s a huge honor to be a finalist and winning would be, well, unbelievable. One of the many things that makes North Carolina an amazing state is it’s ever-changing terrain. From the Blue Ridge and Smokey Mountains in the Western corners of the state to the rolling piedmont to the barrier islands that hold the tales of pirates and colonists, this state has so much to offer. One of the reasons that a project like Tasting North Carolina appealed to me was because of the opportunity to explore (whether physically or virtually) the state that I call mine. What I know about North Carolina is so incredibly limited when compared to what there is available to learn, and I’m loving every part of diving in head first. The first person that contacted me when I started putting feelers out for this project was Alvin Pack, the owner of Green Creek Winery. Green Creek is located in Columbus, the seat of Polk County, nestled in the Blue Ridge mountains just southeast of Asheville. Green Creek has been in business since 2005, but wine making has roots in this state deeper than whole hog barbeque. Starting with Sir Walter Raleigh’s discovery of the muscadine grape in Washington County, North Carolina boasts a 400 year wine making tradition, over 100 wineries, and a temperate enough climate that nearly all varieties of wine grape can grow somewhere within its borders. Now I know, admittedly, very little about wine. I like spicy reds like Malbec, dislike heavily oaked Chardonnays, and can drink a sweet moscato like it’s water on a hot summer’s night. I know from wine tastings that my palate is not sophisticated enough to tell the difference between a $10 bottle and a $100 bottle. Like many consumers my decision to buy a particular wine is 75% price point and 25% label design. And even though I’ve been enjoying wine for years now I’m still familiarizing myself with what North Carolina has to offer. The state’s 100 wineries are scattered through many different regions, meaning you’re as likely to find a winery at the beach as you are driving through the mountains. Varieties range from scuppernog to the Red Chardonnay that Alvin has developed at Green Creek, and practically everywhere you visit you’ll have the opportunity to tour and taste (my favorite way to travel). One of the recipes that Alvin suggested was a Lemon Chardonnay sauce for fish. I loved the idea, so while my mom was down last weekend visiting we picked up a whole shad, stuffed it, and threw it on the grill. Stuffed with lemon, ginger, and garlic the fish was flaky and full of flavor. I chose a shad caught in the Tar River just north of here because shad, like many ocean dwelling fish, migrate upstream to spawn this time of year. And while they probably don’t ever get as far as Polk County, I wanted to honor the flavor of the mountains with a locally caught fish. 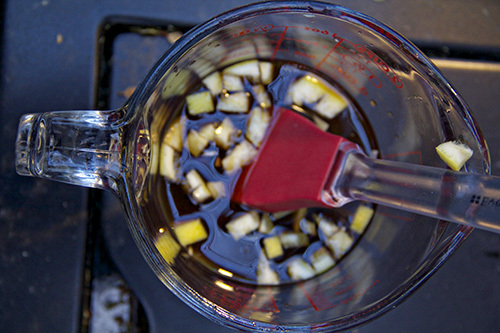 Alvin’s sauce called for Chardonnay, soy sauce, lemon juice, and ginger, which was the perfect compliment of flavors. 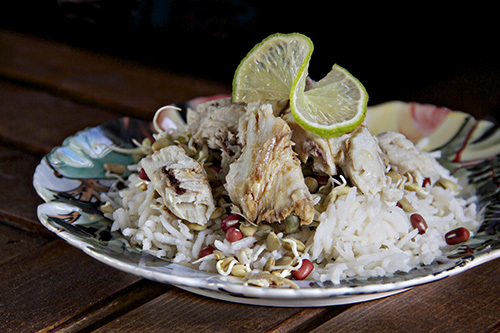 We stuffed and grilled the fish whole and paired it with a lemon basmati rice, sprouted beans (for crunch and color), and a simple arugula salad. It was a wonderful way to spend a Saturday, visiting the beach, picking up a local fish on the way home, grilling it and having an easy and delicious meal with family. Everything that is wonderful about cooking and eating, all at once. 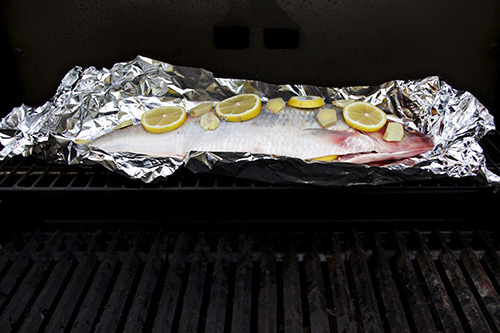 Rinse your fish off and place it on a piece of tin foil larger than the fish. Stuff the cavity with half of your sliced lemon, sliced and peeled ginger, crushed garlic, salt, pepper, and olive oil. 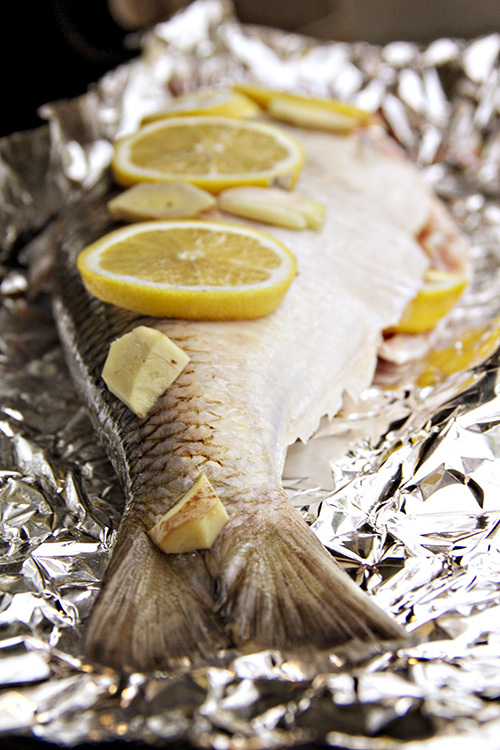 Top the fish with the remaining ingredients and fold the foil up over the edges. Place on the top rack of the grill and heat to 350. In a bowl mix together chardonnay, soy sauce, lemon juice, rind, garlic, and ginger. Pour over fish occasionally, reserving enough to sauce the finished fish. 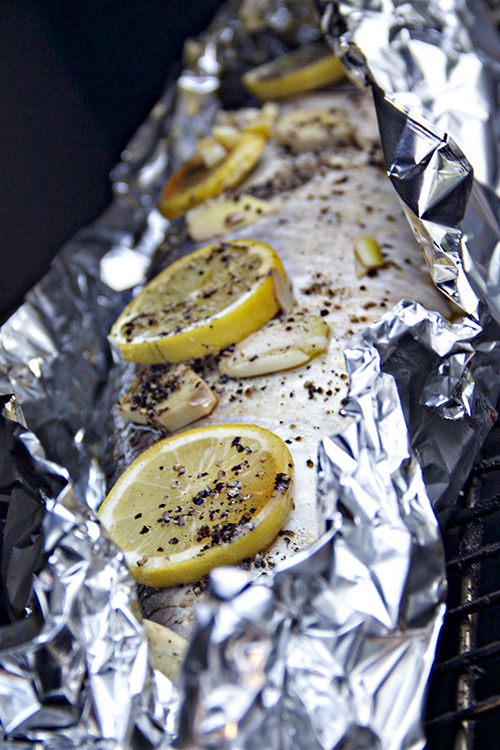 Cook fish for 45-60 minutes or until the skin flakes off easily. Remove from the oven and serve it whole. 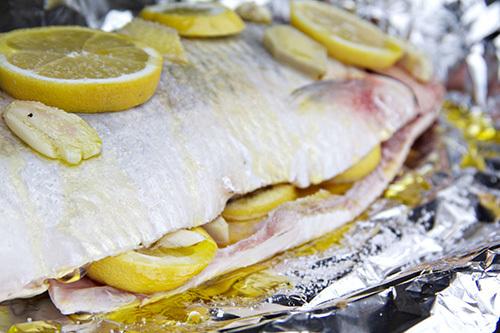 Use a fork or a knife to open the fish up, peeling the skin back. Allow your guests to pick the meat out, and offer the sauce on the side to top the pulled meat.